Don&apos;t get stuck in the dark! Atomic Beam Flashlight is the ultra-bright tactical flashlight. 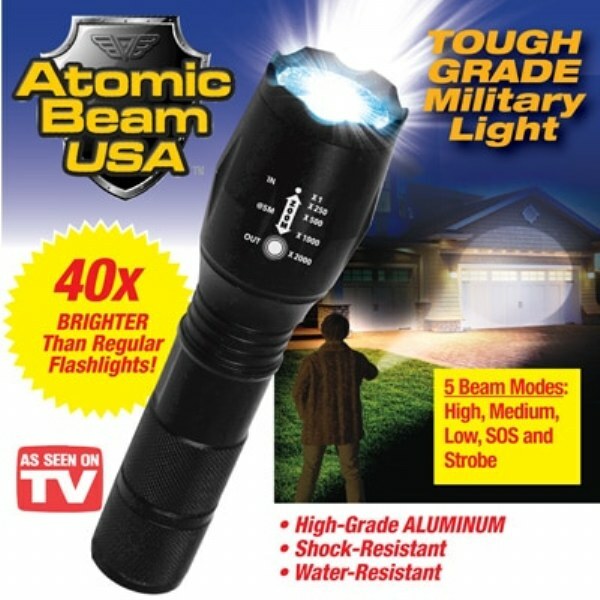 The military uses some of the most powerful lighting in the world, and now that technology is yours to use at home with Atomic Beam Flashlight! Atomic Beam Flashlight is stronger and brighter than regular flashlights. With 5,000 LUX, it&apos;ll light up practically everything. Atomic Beam Flashlight has 5 settings: Low Beam, Medium Beam, High Beam, S.O.S and Strobe. Atomic Beam Flashlight is perfect for whenever you want to see or be seen. Requires 3 AAA not included. Powerful light from such a small unit!